Fifteen science students from across Australia have completed a field trip traversing 1500 km from the centre to the Top End of Australia as part of a field unit from Charles Darwin University’s environmental science (management) degree. The unit, Field studies in tropical and desert landscapes, was originally developed as a joint activity under the CDU/Australian National University Memorandum of Cooperation and has been running for three years. Students from other universities can also take part in the course through cross-institutional enrolment with several students from University of Tasmania joining the group this year. A high level of support from community, industry and government representatives enhanced student insights into the physical, biological and human environments across central and northern Australia with presentations from local experts occurring on location along the transect. Students collected field data at sites along the gradient of increasing rainfall between Alice Springs and Darwin and made use of facilities at the Alice Springs, Katherine and Palmerston CDU campuses on the way. Co-taught by Dr Guy Boggs and Dr Christine Schlesinger, the unit comprises perspectives of physical and ecological systems in arid and tropical environments. Dr Boggs is a senior lecturer in spatial information systems based in the tropical north at CDU’s Casuarina campus, whose research interests in geomorphology and landscape ecology also extend into the drier parts of the continent. 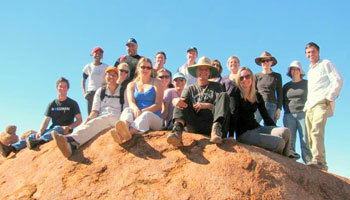 Dr Schlesinger is an arid zone ecologist who teaches environmental science from CDU’s Alice Springs campus.